Akilah Davis reports and covers stories coming out of Cumberland, Harnett and surrounding counties. 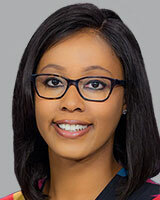 She is one of the Fayetteville bureau reporters for ABC 11 Eyewitness News. Akilah is trading dangerously cold winter temperatures for sunshine and humidity. She comes to North Carolina from Springfield, Illinois, where she spent almost three years as the morning reporter for WICS-TV. She's also worked as a reporter for KWQC-TV 6 in Davenport, Iowa. Her professional journey includes covering Illinois' ongoing budget crisis, the heroin epidemic's impact on newborns in Central Illinois, former President Barack Obama's watch party in 2012 and much more. Akilah graduated from the University of Illinois Urbana-Champaign and received her Master's degree in Public Affairs Reporting from the University of Illinois at Springfield. She is eager to be a part of the Fayetteville community and can't wait to tell the stories of the people who live here. If you see her out and about, feel free to say hi! She loves connecting with viewers in person and over social media. Request Akilah to speak at your event. Months after Hurricane Florence left a devastating impact in North Carolina, many families are still in the rebuilding process. A former soldier, formerly stationed at Fort Bragg, was killed over the weekend after being hit by gunfire at his friend's house. A student with dysplasia cerebral palsy got a heartwarming surprise when an E.E. Smith High School senior asked him to go to prom with her.